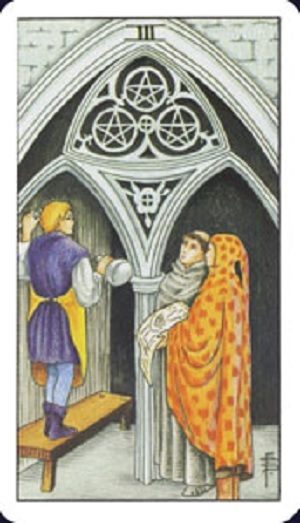 The 3 of Pentacles as depicted in the RWS Tarot. Saturn in Capricorn is a lot like being the General Contractor of a jobsite; something is under construction in whatever area of your chart Saturn is currently transiting and YOU are the foreman overseeing this whole operation. Now as the GC you don’t do all the work yourself – perhaps you take on the work that you’re most qualified to do, but you hire subcontractors to take care of the more specialized jobs like the electrical, plumbing, HVAC, etc. because 1) You acknowledge these aren’t your areas of particular expertise and 2) It frees up your time so your considerable experience can be put to better use ensuring that everything is being done the right way and in the proper order. Every building plan needs someone to supervise its execution – that, my friends, is YOU. Or, to use a different analogy, Saturn in Capricorn is similar to being the CEO of a major corporation; you’ve put the systems, proper framework, and hierarchy in place so you can concentrate on making all those high-level executive decisions. No matter how much of a control freak you are, you can’t possibly do *everything* yourself and have to rely instead on the organizational backbone you’ve established to support you/your business. Saturn in Capricorn is an uber-responsible vibe, so often when it contacts one of our planets or visits a particular House in our chart we tend to put a lot of pressure on ourselves to TCOB. That’s all fine and good; we’re likely very ambitious and working toward some kind of monumental goal. But the weight of that burden may be heavier than expected, so it’s prudent to think about what labor can be delegated to others in order to make the load more manageable. This is not to be confused with pawning off our duties; rather it’s about orchestrating all the proper elements and putting the right support structures in place so we can reach that finish line. Mastering the Art of Delegation is important if we want to be successful during the roughly 2 ½ years that Saturn visits this sign, so by all means hire help, tag out and enlist the support of someone who’s more experienced/qualified at a particular task, and generally put people to work for you if/when possible. You don’t have to be a GC or CEO to do this; try it in any context that works for you/your situation.